According to Tom-- Josh's best friend with two legs instead of four paws-- if a man's phone number is in your mother's speed dial, you may as well shop for a tux. Furthermore, if the same guy buys you a gift, it's a bribe for you to start calling him dad. Unfortunately for Josh (but fortunately for his single mother), both of these things occur in Air Bud 2. The new local veterinarian proves he not only has the ability to win over Josh's four-pawed best friend Buddy by treating a distemper shot as though it were a relaxing massage but he's also won over Mrs. Framm as well, garnering him a sport on her speed dial and on their very first date in giving her basketball loving son a football. Watching this Disney movie (somehow co-produced by Miramax's horror/action/cult brother label Dimension Films) one day after seeing Gossip Girl's Penn Badgely go through the same thing with new would-be evil Stepfather Dylan Walsh, I admit I worried that the vet was a bit too picture perfect myself. 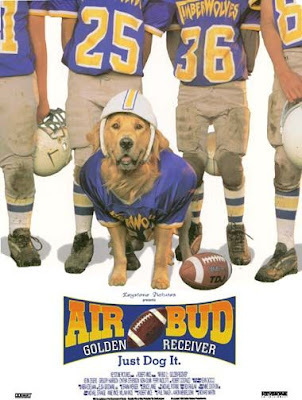 However, he grows on everyone else, except for Josh who actually puts the vet's present to good use by avoiding the afternoons of flirtation and heart-to-hearts involving Mrs. Framm and her new man by joining the junior high's football team. Although all Josh wants is to get away for the afternoon, historically the team is embarking on what many worry will be the start of a decade long losing streak. Hoping to succeed as a two-sport athlete along with Tom who's just joined for the girls that in eighth grade have “become women,” while Josh struggles to build up his confidence, it's Buddy who proves to be the natural. And soon, junior high school regulations, children's allergies and safety concerns be darned, Buddy is playing right along with the the teens. 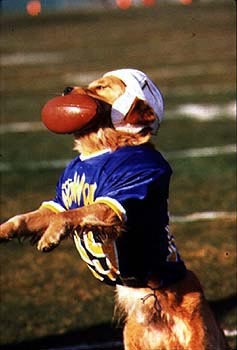 When the underdog group starts winning, largely thanks to Buddy and Josh who's able to “read” his dog very well, hope arrives for Timberwolves coach (Robert Costanzo) who-- because he openly favors fun and sportsmanship over touchdowns and tackles-- was given the school principal's ultimatum that losing the season means losing his job as well. Certainly, there's more than enough plot contained in these paragraphs alone to have comprised Disney's sequel to the heartwarming and surprisingly delightful original title wherein Josh met Buddy. Unfortunately, however, once again to unsatisfactory effect, the film adheres to Disney's mandate that the addition of campy villains always makes a movie even more entertaining. And while the cartoonish and obviously Rocky and Bullwinkle inspired Boris and Natasha knock-off Russian animal circus organizing criminals are woven throughout the movie, it never flows with the heart of the film, which is of the two-legged variety more than the four-pawed one in the sequel. Although plot-wise overall, it's just a retread of the first flick as Josh must once again adjust to something new. 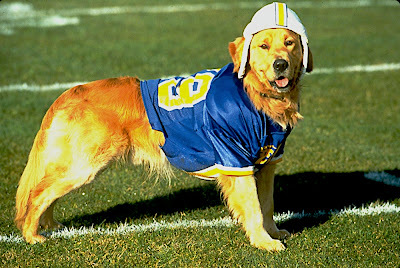 And while there's plenty of unbelievable canine athlete scenes to delight kids, Air Bud: Golden Receiver suffers immensely from the inclusion of the villains who at times feel like they were added in post-production in order to dumb it down and insert a few more toilet gags to appeal to the lowest common denominator in family entertainment. For, when the villains receive their comeuppance, it feels silly instead of earned, like a less elaborate version of the first and best two Home Alone ventures that quickly jumps into gross-out territory we'd see yet again in the live action sequel, 102 Dalmatians. 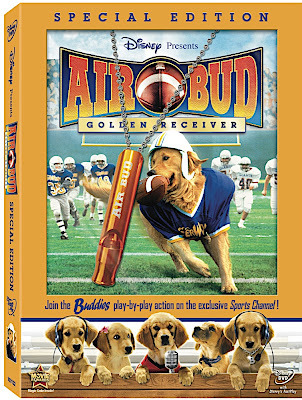 Yet, ultimately, while Air Bud 2 most likely won't endear adults as much as the original did, it's still light years better than Air Bud's offspring of Disney's Buddies franchise. The Buddies show up to provide "sports channel" commentary as the movie plays. However, parents will want to skip it in favor of the actual movie given the very timely, relatable concept of widowed/widower and/or divorced parents moving on and letting someone else new in the family. 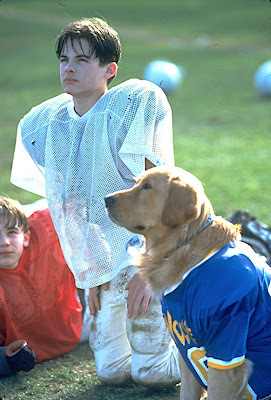 And this theme is best articulated by the most fascinating character of Golden Receiver in Robert Costanzo's coach as he uses sports as a metaphor to discuss fathers, making us all the more moved that Josh has such a tremendous support system in his life, from siblings to parents old and possibly new to coaches and a four-pawed friend named Buddy, who may need to be fitted for a tux soon.